This is not by accident. The media circus leading up to the elections, the name calling in the halls of Congress, the vitriol and barbs traded back and forth among people who are supposed to be working together to improve the country, are all components of the game set up by those who run the show. The movers and shakers behind these engaging, but ultimately trite, political exercises are the elite, the so-called upper class, who benefit from the status quo. This status quo is marked by an economic crisis with no end in sight, by the slow but steady growth of a police state aimed at the lowest rungs of society, and a political circus which keeps us enraptured long enough that we don’t question what’s really going on. This lobbying is buoyed by a congressional lifestyle which demands that our representatives spend the majority of their time fund raising for campaigns, rather than responding to the needs of their constituents. In November 2012, the Democratic House leadership offered a model daily schedule to newly elected Democrats which suggests a ten-hour day, five hours of which are dominated by “call time” and “strategic outreach,” including fund raisers and correspondence with potential donors. Three or four hours are for actually doing the job they were elected to do, such as attending committee meetings, voting on legislation, and interacting with constituents. The influence of corporate money on Congress is exacerbated by how out of touch Congressmen are with the daily struggles of most Americans. In February 2012, the median net worth of Congressmen was $913,000 as compared to $100,000 for the rest of the population. Aside from being immediately wealthy, Congressmen also weathered the tribulations of the financial crisis much better than the average American. An analysis of Congressional finances by theWashington Post in October 2012 revealed that the wealthiest one-third of Congress was largely shielded from the effects of the Great Recession. While the median household net worth of the average American dropped by 39 percent between 2007 and 2010, the median wealth of Congressmen rose 5 percent. It rose 14 percent for the wealthiest one-third. “The ultimate measure of a man is not where he stands in moments of comfort and convenience, but where he stands at times of challenge and controversy.”― Martin Luther King Jr.
As one who came of age during the civil rights era, I was profoundly impacted by the life and teachings of Martin Luther King Jr. He taught me so much more than just what it means to look beyond the color of a person’s skin—he taught me that life means nothing if you don’t stand up for the things that truly matter. And what are the things that matter? King spoke of them incessantly, in every sermon he preached, every speech he delivered and every article he wrote. Freedom, human dignity, brotherhood, spirituality, peace, justice, equality, putting an end to war and poverty—these are just a few of the big themes that shaped King’s life and, in turn, impacted so many impressionable young people like myself. Fast forward 40 years, and we find ourselves living through historic times, with the nation’s first black president embarking on his second term in office. The comparisons between President Obama and King have been inevitable and largely favorable, helped along by Obama, who spoke at King’s Ebenezer Baptist Church in 2008, a year before taking office—accepted the Democratic nomination on the anniversary of King’s “I Have a Dream” speech—presided over the installation and dedication of a national monument to King in Washington, DC—and took his oath of office using one of King’s Bibles on the national holiday dedicated to King. We’d be doing King and his legacy a profound disservice, however, if we do not insist that Obama do more than pay lip service to the man he credits, alongside Abraham Lincoln, as being one of his two heroes. Indeed, Obama spent much of the last four years campaigning for re-election and will likely spend the next four attempting to establish a lasting legacy for his presidency. If Obama wants to be remembered for anything more than the color of his skin, he would do well to brush up on King’s teachings, which were far more radical than the watered-down pap about him being taught today. The following key principles, largely absent from Obama’s first term in office, formed the backbone of Rev. King’s life and work. Practice non-violence, resist militarism and put an end to war. Contrast this with Obama’s use of the power of his office to expand America’s military empire at great cost to the nation, authorize drone strikes which have wreaked havoc on innocent civilians, and defend indefensible police tactics used in SWAT team raids and roadside stops. Obama’s national security budget for 2013, which allots a whopping $851 billion to be spent on wars abroad, weapons and military personnel, significantly outspends the money being spent on education, poverty and disease. With roughly 25 lobbyists per Congressman, corporate greed largely calls the shots in the nation’s capital, enabling our elected representatives to grow richer and the people poorer. One can only imagine what King would have said about a nation whose political processes, everything from elections to legislation, are driven by war chests and corporate benefactors rather than the needs and desires of the citizenry. Stand up for what is right, rather than what is politically expedient. New York City has long been celebrated as the cultural capital of the world, renowned for its art, music and film. Presently, however, the “city that never sleeps” is serving as the staging ground for a futuristic police state operated, in large part, by Mayor Bloomberg and the New York Police Department (NYPD). 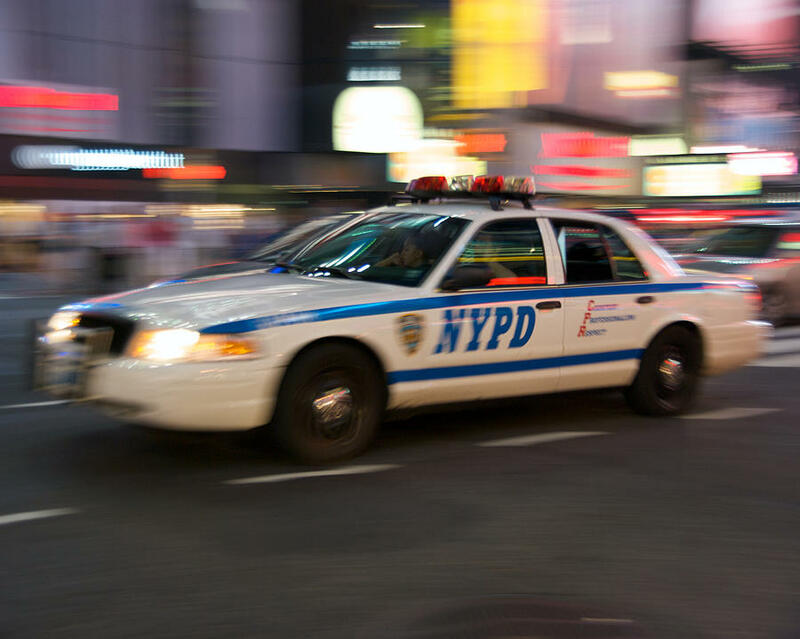 Now, in their latest nod to so-called crime fighting, the NYPD is proposing that “pharmacies in and around the city to fight prescription drug thefts by stocking pill bottles fitted with GPS tracking chips.” Mind you, these are the same people who have required that GPS devices be attached to NYC taxis in order to track cabbies’ movements. What we are witnessing, thanks in large part to zero tolerance policies that were intended to make schools safer by discouraging the use of actual drugs and weapons by students, is the criminalization of childish behavior. Most recently, for example, two 6-year-old students at White Marsh Elementary School in Maryland were suspended for using their fingers as imaginary guns in a schoolyard game of cops and robbers. The age-old game of cops and robbers is one I played as a child. “I’m gonna get you, robber,” one kid yells, chasing his friend across the playground. The other boy turns and points his finger before racing away. The cops are in hot pursuit. “Bang, bang, you’re dead,” one shouts. “No! Bang, bang, you’re dead!” the other cries, before both melodramatically fall to the ground. Thus goes a game played by boys from time immemorial. In a new wrinkle on this old game, however, it’s not the cop who gets the bad guy. Now, the game ends when school officials summon real cops–who arrest the kindergartners for engaging in juvenile crime. That happened at a New Jersey school, from which four little boys were suspended for pretending their fingers were guns. At another school, an 8-year-old boy was arrested and charged with terrorism for pointing a paper gun at classmates and announcing, “I’m going to kill you all.” Officials at a California elementary school called police when a little boy was caught playing cops and robbers at recess. The principal told the child’s parents their child was a terrorist. Unwittingly, the principal was right on target: These are acts of terrorism. The culprits here, though, are not overactive schoolchildren; those guilty of terrorizing young children and parents nationwide are school officials who–in an effort to enforce zero tolerance policies against violence, weapons and drugs–have moved our schools into a lockdown mentality. Unfortunately, these are not isolated incidents, nor are they limited to episodes of cops and robbers. Adopted in the wake of Congress’ passage of the 1994 Gun-Free Schools Act, which required a one-year expulsion for any child bringing a firearm or bomb to school, school zero tolerance policies were initially intended to address and prevent serious problems involving weapons, violence and drug and alcohol use in the schools. However, since the Columbine school shootings, nervous legislators and school boards have tightened their zero tolerance policies to such an extent that school officials are now empowered to punish all offenses severely, no matter how minor. Hence, an elementary school student is punished in the same way that an adult high school senior is punished. And a student who actually intends to harm others is treated the same as one who breaks the rules accidentally–or is perceived as breaking the rules. For more information about John W. Whitehead and the work of The Rutherford Institute, visit www.rutherford.org. Drones—unmanned aerial vehicles—come in all shapes and sizes, from nano-sized drones as small as a grain of sand that can do everything from conducting surveillance to detonating explosive charges, to massive “hunter/killer” Predator warships that unleash firepower from on high. Once used exclusively by the military to carry out aerial surveillance and attacks on enemy insurgents abroad, these remotely piloted, semi-autonomous robots have now been authorized by Congress and President Obama for widespread use in American airspace. The military empire is coming home to roost. As the Orlando Sentinel points out, surveillance drones could soon be flying over Orlando skies as early as this summer.